The Jupiter Railroad Bridge crosses at the mouth of the Loxahatchee River just west of the SR-811 Concrete Trestle Bridge (FDOT #930339). 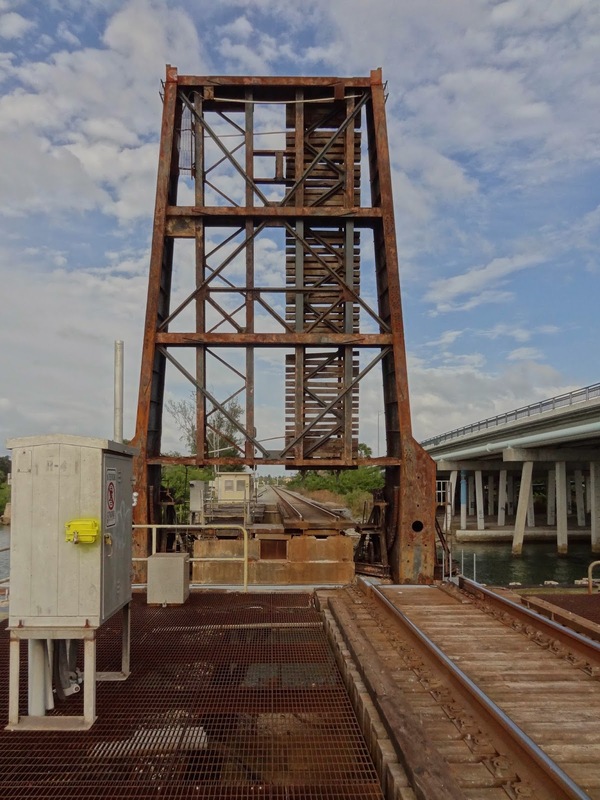 The SR-811 Bridge is taller and has timber fenders adjacent to the bascule span of the railroad bridge to allow smaller boats passage between the Loxahatchee River and the Intracoastal Waterway (see photo below). The Railroad Bridge consists of a rusty plate girder superstructure and a big caisson substructure that rises just above the water surface. It originally had two sets of tracks but the western tracks were removed. I walked on the bridge to get a closer view of the bascule span, but it was difficult because of the large spaces between the timber ties. The Jupiter Railroad Bridge is about 600 ft long and it was built in 1925. It's owned by the Florida East Coast (FEC) Railway. The bridge crosses the river channel with a 40 ft long single leaf bascule span that remains open except when a train comes across the bridge. Palm Beach County, Florida Bridges: Jupiter Railroad Bridge (and SR-811 Highway Bridge) across the Loxahatchee River by Mark Yashinsky is licensed under a Creative Commons Attribution-NonCommercial-NoDerivatives 4.0 International License.